The Intercity-Express (written as InterCityExpress in Austria, Denmark, Switzerland and, formerly, in Germany) or ICE ( [iːtseːˈʔeː]) is a system of high-speed trains predominantly running in Germany and its surrounding countries. It is the highest service category offered by DB Fernverkehr and is the flagship of Deutsche Bahn. The brand name "ICE" is among the best-known in Germany, with a brand awareness close to 100%, according to DB. There are currently 259 trainsets in five different versions of the ICE vehicles in use, named ICE 1 (deployed in 1991), ICE 2 (1996), ICE T (1999), ICE 3 (1999) and ICE TD (2001–2003, back in service 2007). The ICE 3, including its variant models, is made by a consortium led by Bombardier and Siemens. Procurement of a further version, ICx, began c. 2008, and was rebranded ICE 4 in late 2015. Introduction of the trains are expected from 2016. Apart from domestic use, the trains can also be seen in countries neighbouring Germany. There are, for example, ICE 1 lines to Basel and Zurich. ICE 3 trains also run to Liège and Brussels and at lower speeds to Amsterdam. On 10 June 2007, a new line between Paris and Frankfurt/Stuttgart was opened, jointly operated by ICE and TGV trains. ICE trains to London via the Channel Tunnel are planned for 2018. While ICE 3M trains operate the Paris-Frankfurt service (with the exception of trains 9553/9552, which operate with TGV Duplex equipment and are cross-crewed with both SNCF and DB staff), SNCF's TGV runs from Paris to Munich (via Stuttgart), with mixed crews on both trains. German and Austrian ICE T trains run to Vienna. On 9 December 2007, the ICE TD was introduced on the service from Berlin via Hamburg to the Danish cities of Aarhus and Copenhagen. The Spanish railway operator RENFE also employs trains based on the ICE 3 (Siemens Velaro) called AVE Class 103 which are certified to run at speeds up to 350 km/h. Wider versions were ordered by China for the Beijing–Tianjin Intercity Railway link (CRH 3) and by Russia for the Moscow – Saint Petersburg and Moscow – Nizhny Novgorod routes (Velaro RUS). To overcome the restrictions imposed on the ICE 1 and ICE 2, their successor, the ICE 3, was built to a smaller loading gauge to permit usability throughout the European standard gauge network (except the UK non-highspeed network) . Unlike their predecessors, the ICE 3 units are built not as locomotive-pulled trains (albeit aerodynamically optimised), but as electric multiple units with underfloor motors throughout. This also reduced the load per axle and enabled the ICE 3 to comply with the pertinent UIC standard. The latest generation ICE 3 is known as the New ICE 3, and is part of the Siemens Velaro family with the model designation Velaro D. It currently runs on many services in Germany and through to other countries like France. These trains were meant for the planned Deutsche Bahn services through the channel tunnel to London. Due to delay in the delivery of the new Velaro D rolling stock the London service was cancelled. Procurement of ICx trainsets started c.2008 as replacements for locomotive hauled InterCity and EuroCity train services- the scope was later expanded to include replacements for ICE 1 and ICE 2 trainsets. In 2011 Siemens AG was awarded the contract for 130 seven car intercity train replacements, and 90 ten car ICE train replacements, plus further options - the contract for the ten car sets was modified 2013 to expand the trainset length to twelve vehicles. The name ICx was used for the trains during the initial stages of the procurement; in late 2015 the trains were rebranded ICE 4, at the unveiling of the first trainset, and given the class designation 412 by Deutsche Bahn. Two pre-production trainsets were manufactured and used for testing prior to introduction of the main series. The line most heavily utilised by ICE trains is the Mannheim–Frankfurt railway between Frankfurt and Mannheim due to the bundling of many ICE lines in that region. When considering all traffic (freight, local and long distance passenger), the busiest line carrying ICE traffic is the Munich–Augsburg line, carrying about 300 trains per day. A reservation was mandatory on the ICE-Sprinter until December 2015. In addition to the usual 1st class service (on-seat service, free newspapers like Financial Times Deutschland or Handelsblatt), the 1st class in the Sprinter trains also offers free drinks, an on-seat breakfast or dinner and additional newspapers. In the 2nd class, newspapers are provided in the carriages at no extra cost. Since December 2006, Stuttgart Hbf and Zürich HB have been connected by a bi-hourly service. This service however has been replaced by a daily Intercity service since March 2010. The ÖBB in Austria also uses two ICE T trainsets (classified as ÖBB Class 4011) between Wien Westbahnhof, Innsbruck Hauptbahnhof and Bregenz (without stops in Germany), although they do not use tilting technology. Since December 2007 ÖBB and DB offer a bi-hourly connection between Wien Westbf and Frankfurt Hbf. In addition, ICE Trains to London via the Channel Tunnel are on the horizon, perhaps in 2020. Unique safety and security requirements for the tunnel (such as airport-style checks at stations) as well as hold-ups in the production of the Velaro-D trains to be used on the route have delayed these plans. The ICE accident near Eschede that happened on 3 June 1998 was a severe railway accident. Trainset 51, travelling as ICE 884 "Wilhelm Conrad Röntgen" from Munich to Hamburg, derailed at 200 km/h (125 mph), killing 101 and injuring 88. It remains the world's worst high-speed rail disaster. On 22 November 2001, powerhead 401 020 caught fire. The train was stopped at the station in Offenbach am Main near Frankfurt a.M. No passengers were harmed, but the fire caused the powerhead to be written off. On 6 January 2004, ICE TD trainset 1106 caught fire while it was parked at Leipzig. Two cars were written off, and the others are now used as spares. Powerhead 401 553 suffered major damage in a collision with a car on the Mannheim–Frankfurt railway in April 2006. In the Netherlands, a comparably low €2,40 surcharge has to be paid for each trip on the "ICE International" when travellers are not holding an international ticket. Only passengers with a student travel card or a NS-Business card can travel within the Netherlands without having to pay the surcharge. Various ICE train scale models in several scales have been produced by Märklin, Fleischmann, Roco, Trix, Mehano, PIKO. and Lima. In January 2010, the European railway network was opened to a liberalisation intended to allow greater competition. Both Air France-KLM and Deutsche Bahn have indicated their desire to take advantage of the new laws to run new services via the Channel Tunnel and the High Speed 1 route that terminates at London St Pancras. A test run of an ICE train through the Channel Tunnel took place on 19 October 2010. Passenger-carrying ICE trains, however, will have to meet safety requirements in order to transit the Channel Tunnel. Although the requirement for splittable trains was lifted, concerns remain over the shorter length of ICE trainsets, fire safety, and the ICE's distributed power arrangements. There have been suggestions that French interests have advocated stringent enforcement to delay a competitor on the route. Eurostar also recently chose Siemens Velaro-based rolling stock; there were concerns that Alstom (builders of the passenger trains that already use the Tunnel) and the French Government would take the matter to court. In October 2010, the French transport minister suggested that the European Railway Agency (based in France) should arbitrate. After safety rule changes which might permit the use of Siemens Velaro rolling stock, the French government dismissed their delegate to the Channel Tunnel Safety Authority, and brought in a replacement. In March 2011, a European Rail Agency report authorized trains with distributed traction for use in the Channel Tunnel. This means that the ICE class 407 trains which DB intends to use for its London services will be able to run through the tunnel. 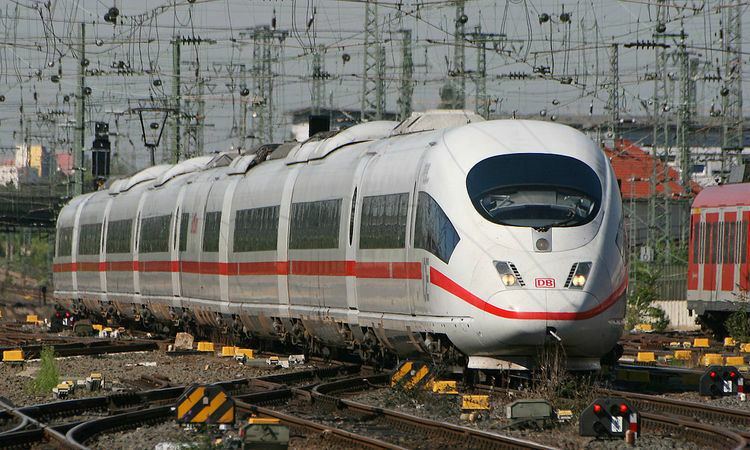 In February 2014, however, Deutsche Bahn announced further difficulties with launching the route, and reports make it seem unlikely that service will start anytime this decade. A new ICE service from Munich to Zurich via Lindau is planned to start after 2020 when the electrification and modernization works in the 150 km section between Geltendorf and Lindau will be completed. The journey times will be then cut by 45min to less than 3 hours and 30 minutes and the line between Munich and Zurich is expected to be served by up to eight trains per day running at speeds up to 160 km/h. From its inception in July 1991 to 2006, ICE has transported roughly 550 million passengers, including 67 million in 2005. The cumulative sum of passengers is roughly 1.25 billion in 2015. In 2006, Lego modelled one of its train sets after the ICE. A Railworks add on is available for Train Simulator 2012 accurately reflecting the original 1991 version of the ICE on German tracks (Siegen to Hagen). There is also an addon utilising the Munich - Augsburg line using ICE 3 trainsets.